In this section, we will walk you through the C++ API for using kinematics in MoveIt!. In this example, we will walk through the process of using these classes with the Panda. Using the RobotModel, we can construct a RobotState that maintains the configuration of the robot. We will set all joints in the state to their default values. We can then get a JointModelGroup, which represents the robot model for a particular group, e.g. the “panda_arm” of the Panda robot. We can retreive the current set of joint values stored in the state for the Panda arm. setJointGroupPositions() does not enforce joint limits by itself, but a call to enforceBounds() will do it. Now, we can compute forward kinematics for a set of random joint values. 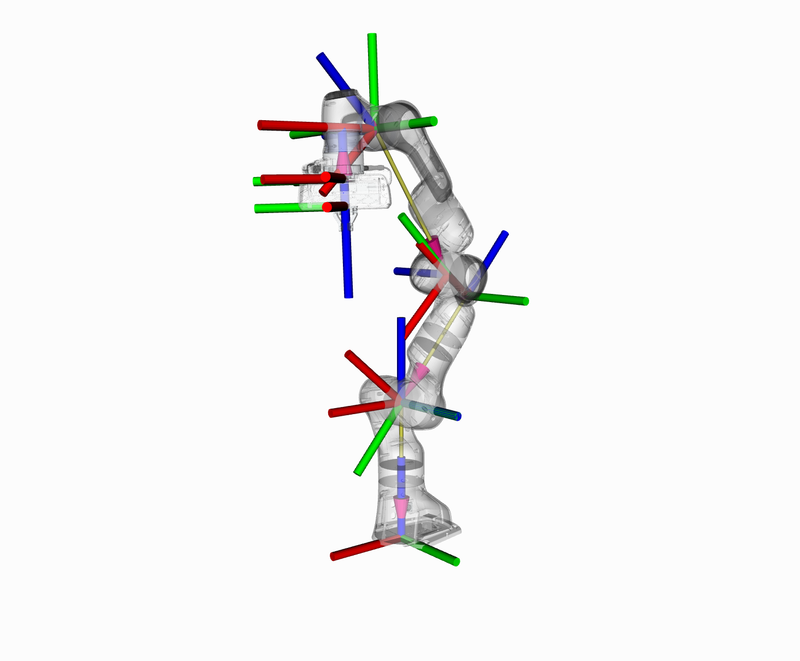 Note that we would like to find the pose of the “panda_link8” which is the most distal link in the “panda_arm” group of the robot. The desired pose of the end-effector (by default, this is the last link in the “panda_arm” chain): end_effector_state that we computed in the step above.